In 2015 the Austrian Jazz-Band Mario Rom‘s INTERZONE will not only release their new Album „Everything is Permitted“ but also a 4-part Online-Video-Series under the same title. This series of music-videos was shot in Mexico City, New Orleans, Texas, Louisiana, Austria and Germany and is a unique project in the European Jazz Scene combining a continuing plot with non-dialogue, jazz-music-only videos. 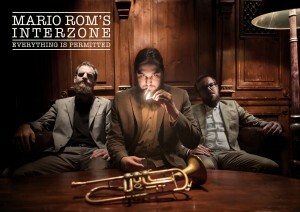 Mario Rom‘s INTERZONE is a band formed out of a need to play music at the most basic and perhaps the only sensible way: without any rules or forced complexity. It includes three of Austria‘s most promising young musicians, all around 26 years of age: Mario Rom, despite his age, is already one of the leading trumpeters of his generation. Lukas Kranzelbinder is not only one of Austria‘s most sought-after jazz bassists but has also composed an opera premiering in July 2012. Herbert Pirker, one of the busiest drummers in Europe, has shared the stage with virtually every respected Austrian musician.